Bienvenue! I am a FSL teacher at St. Elizabeth Ann Seton Catholic School, Ottawa, Ontario. I use this blog as a communication tool for students/parents and my own professional learning. It was great to meet the parents/guardians this evening! Thank you all for taking the time to listen to my presentation with Mme Kohut. We hope we were able to answer your questions about curriculum and classroom expectations. Forms, newsletters.. they keep coming!!! In case you missed some forms or newsletters from the first week of school, below are some that were given to your child (most were given in homeroom). This blog has been on hiatus for the 2015-16 school year. It will be back up and running September 2016. Now that the school year is officially over, I wanted to share all the hard work my Gr 4's and 5's produced this year for our Pen Pal project with students in Lyon France. My students learned so much from our friends in France, their culture, how they communicate, their school environment etc. They highly enjoyed the correspondence and were so eager to hear from them! It made learning French this year more meaningful and authentic. Thank you to my School Board for providing this opportunity! A special thanks to our friends at École Misérieux! During the week of March 9-13, 2015, the Gr 4 students celebrated la francophonie by participating in a collaborative activity with students from St. Emily. Gr 4s at St Cecilia were grouped with a Gr 4 students from Mme Kohut's Gr 4 class. Team leaders were given a Google Doc with the required instructions to choose a flag, determine the country the flag belongs to, answer questions about how that country is affiliated with la francophonie, then conclude their activity with an extension activity. 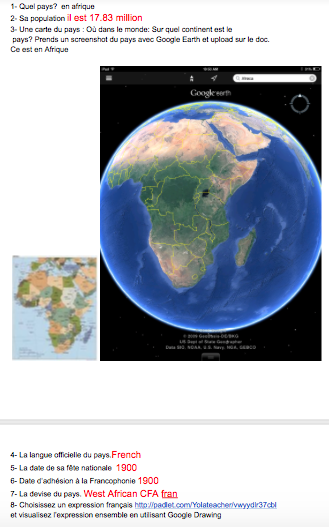 Students had roles: leader (who had full control over the document), researcher who would either have an iPad or Chromebook for researching and the photographer (with an iPad) was in charge of finding photos (e.g., capture the country on Google Earth). Students had to collaborate together to complete the activity. They had to be in constant communication with the students at St Emily via Google Video, Chat, and e-mail in order to complete the collaborative activity. 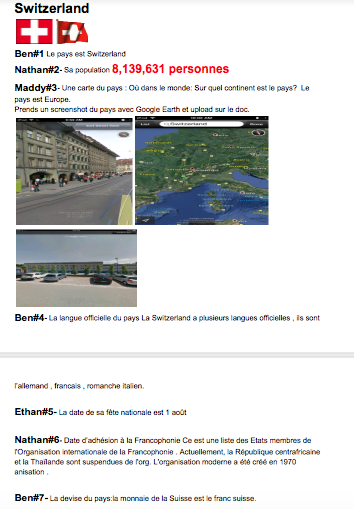 The final task entailed students to choose a French Expression (which was given to them via Padlet). 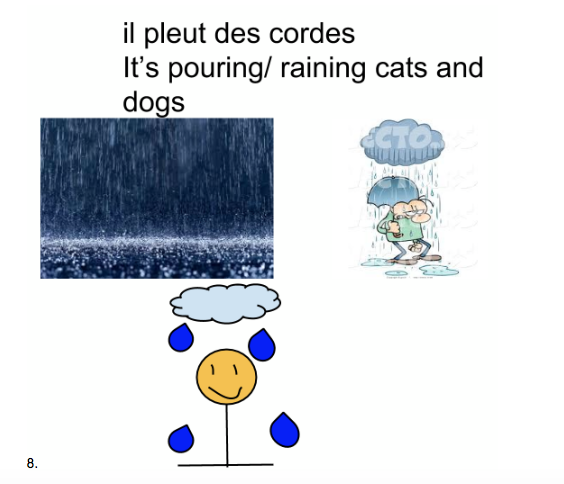 They had to research the French expression and collaboratively illustrate the meaning of the expression on Google Drawing (this included the English translation of the expression too). It was a great collaborative experience for the students. I have never seen my Gr 4's so engaged! They would come early to class every day that week because they wanted to get started on this project. The challenge was motivating enough for them to be continuously engaged. There were some technical difficulties when trying to communicate with the other students from St. Emily, which was a great learning experience for students to problem solve when trying to use technology to communicate with others. The Grade Fives have been working very hard on the Energy Diet Challenges. Click on the above link to look at our progress. They were put into groups to work on challenges of their choice. I am extremely impressed on how motivated they are to complete the challenges. In my opinion, this has been a rich learning task for students as they have been collaborating, using their creativity, some have been innovative with their challenges, thinking critically about aspects of our energy unit and applying their learning about energy present within our school, community, nation and some have ventured out to compare aspect of energy based in cities around the world. Below are student written reflections of their challenges. Salut! Je m’appelle Elissa. Pour la projet du l’énergie, j’ai travaillée avec Malia et Kate. La projet est environ de construirer un exposition de l’art avec les choses qui est recyclable. Nous sommes constuirée un robot avec du papier et du carton. On s’appelle Meap. Ca c’est un photo du Meap. Nous sommes constuirée Meap pour 10 points. Pour 10 points, tu avoir constuirer la exposition de l’art est mettre la exposition de l’art dans l’école. Pour les 15 points tu avoir constuirer un exposition de l’art et mettre ca dans la communauté. Malia, Kate et moi on pense la projet pour la 15 points est très difficile parce que nous besion constuirer la exposition du l’art imperméable alors ca c’est très difficile. 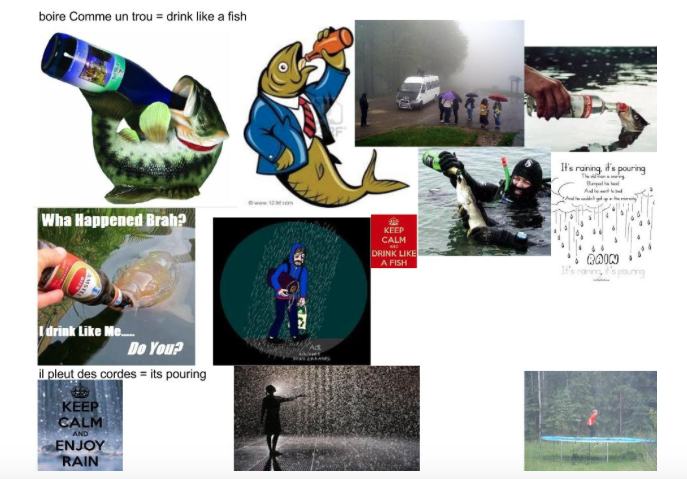 J’ai aimée la projet parce que ca c’est améliorer notre collaboration. 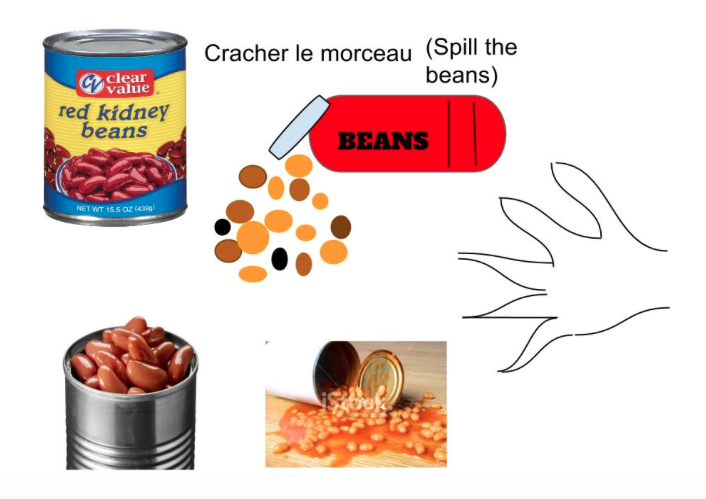 La projet a aider moi pour identifiée les choses qui est recyclable. Le projet c’est sur l’energie program. Moi et Cassidy travail sur le “ Buckle Up. 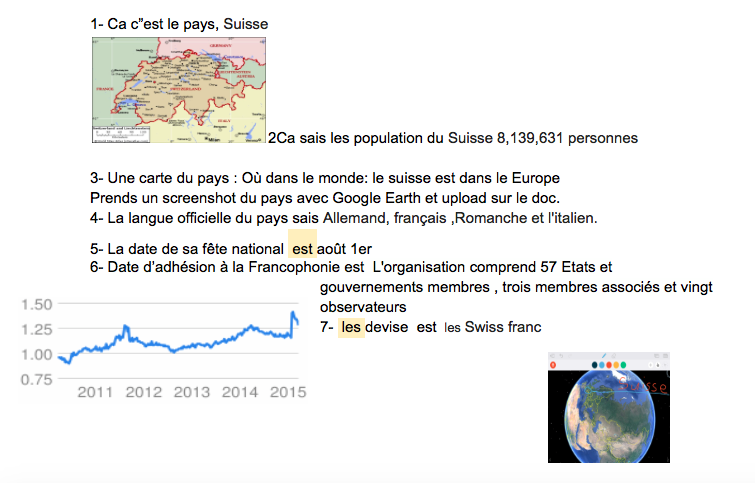 “ Buckle Up c’est quand tu ecrite un map de nos communauté. Aussi nous encore besion a surligner le route ça utiliser moin l’energie. Aussi nous on ecrite comment c’est route c’est le plus efficace. Sophie et Cassidy adore le program il est très bonne. It was about non renewable and renewable energy. We filled out questions about energy. We chose batteries as non-renewable energy. We needed to say what it would do in the future. We said that people would make better batteries that were stronger. We after chose another one and it was to do a little movie about solar energy. It was really fun but we could not upload it. The goal of this project was to make an energy efficient car that used solar power. Our energy project was a lot of fun. Anderson,Ian and I built a cardboard car it was a big challenge but also a lot of fun. We had to go from class to class asking for cardboard some cardboard we even had to take out of the garbage. It was hard enough for us to design our car because we tried to design a truck but we did it and it look pretty good. We also had to get markers to colour the car. When we did have our design and the markers we had to get tape or some other type of stickiness. So when we did find tape it was super hard to get the right pieces of cardboard for the design we wanted. We ended up having to make a new design for the materials that we had. So when we all agreed on one design we started to cut the cardboard and started to build. 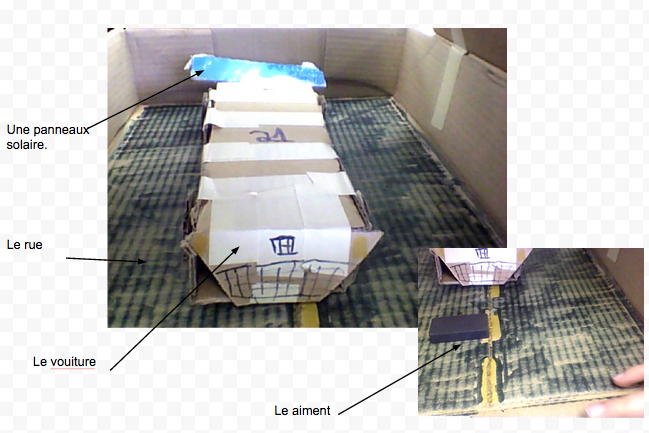 We built this car to represent how much energy cars use.At the end of the project our car turned out pretty good. It looked like a good team effort and it was definitely a big challenge, but if I had another chance to do another challenge I would do it with no doubt! We also made it move with magnets F.Y.I... it was awesome!!!!! Phantom power is the power source from ipad chargers that are in use whereas mini ovens that are plugged into the wall, do not use energy when not in use. But what people don’t realize is that the reason their energy bill is sky rocketing is because certain devices that are plugged will use energy even when not in use. For example a kettle that is done heating water, will stop using that energy. However an iPad that is plugged in will continue to use energy as it is constantly charging up. During this time period we have gone around the entire school to find the devices that are plugged in all day, and we found that there was 289 things that are plugged in for around 150 and 190 days. We have learned that most teachers will leave their chargers in the wall after they took there device out.Also that they leave it charging after its fully charged. We also interviewed teachers about how they could reduce phantom power.